Posted by Phil Groom in Current Affairs, Death, Life, Mental Health. Posted by Phil Groom in Campaigns, Life, Mental Health. THIS IS A POST that’s long overdue, that I should have posted about a week ago, and as I finally write it I am thankful, exhilarated and terrified all at once. Thankful to everyone who has risen to the challenge of my 200 People to Save Ali Quant post a couple of weeks ago, to everyone who voted in the poll to choose a name; exhilarated by the enthusiasm people have shown for getting the bigger project envisaged by Ali off the ground; and terrified by the question, What if…? One small change can provoke a hurricane. I have been trying to hold onto this recognition. To not kill it with scepticism nor lose it in the light of the very real and very enormous challenges that people are facing today. The fact that a smile can bridge disconnection. That one kind word can stop an angry one. That one person – and another one person – and another one person – can have quite a mighty impact. That what is given to me – I give to the next person – who gives it to the next person – who might one day change the world. It is this last bit that has really got me thinking. It continually amazes me how interconnected we, as people, are. We see the big ripples but we do not always acknowledge – or recognize – the little ones from which they are made. Until. That’s what terrifies me. Until what? Until it crashes against the shore, the cliff face of immovable bureaucracy that our government seems to represent; or until it flows around that cliff face, turning it into an irrelevance because this, this little ripple we’ve started, is part of something stronger, something more powerful, something that flows from people’s hearts. … I look at what I’ve started with 5 Quid for Life and, quite frankly, it terrifies me: who am I to start something like this? On what basis should anyone trust me or anyone else in the group? And what if it doesn’t work? What if we end up with people crying for help and we’re not ready or we don’t have the funds available? What if, what if…? It was a three horse race, with 5 Quid for Life and Safety Net Trust neck and neck followed closely by The Real Big Society. In the discussions that followed we threw out the Big Society option, not wanting to tie in too closely to something identified with a particular administration: whilst I guess most of us involved in the project do have pretty strong political views, this is not a political project; it is, rather, something that transcends politics, an idea that I hope anyone, of any political persuasion or none, can take hold of. 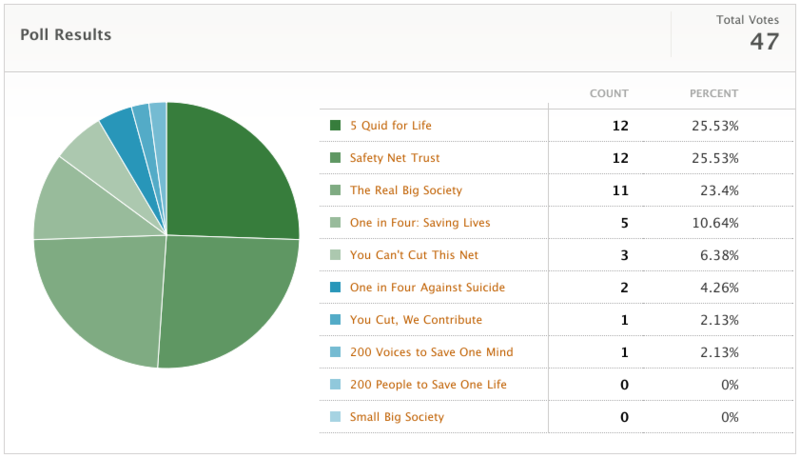 So we took the two winners and combined them: 5 Quid for Life: A Mental Health Safety Net was born. It’s early days yet: as I said in my introductory post, there are still a lot of details to hammer out. But we’re getting there; and I — I am thankful, exhilarated and terrified. Join me for the ride, if you will: we’re on facebook and twitter too. You may not be able to commit to the £5 per month we’re asking for, but you can still stand in solidarity with us, with people like Ali whose lives are in jeopardy. You too can be part of this ripple and help it become a wave. Posted by Emma Jayne in Christianity, Life, Theological Reflection. This passage shows us God designed us the way we are. You’re not a mistake. God said let there be light, and there was light. He said let there be Andy and there was Andy, let there be Emma and there was Emma. Just as God looks at creation and thinks it’s good so too he looks at you and thinks you’re pretty great. We can enjoy his pleasure over us… in the same way we enjoy it when our parents or mates tell us we’re great. Let there be Emma! Well yes, amen to that; love the affirmation of my being a gay Christian woman: not quite what I’d expected from the Evangelical frontline. Thanks guys. But really? Seriously? God designed us the way we are?? Forgive me if I fall about laughing, because that’s one God with a seriously warped sense of humour at best, if not an outright monster at worst. So… God designed us the way we are… God designed us to be susceptible to all kinds of sicknesses and diseases … which God also designed. God designed us with minds that fall apart under stress or trauma. God designed us to go mental at the flick of an invisible inner switch. God designed us to be tasty snacks for crocodiles, mosquitoes and piranhas … which God also designed. God designed us for life on a planet that’s ultimately gonna disappear in an amazing starburst as dear old Sol goes nova a few million years down the line… which we’re ruining in the meantime with our supposedly God-given talents to uproot and destroy, to the point where it’s likely to be uninhabitable long before that amazing starburst…. Sorry guys, but the universe does not hinge upon the human race. The claim that our mythical Adam & Eve rebelling against God in the Garden of Eden led to the corruption of the entire cosmos is simply breathtaking in its arrogance — like the belief that the Sun revolves around the Earth, only a billion times worse. You have only to open your eyes and look out at the vastness of the universe to begin to realise how puny and insignificant the human race is. We are specks of dust bouncing around on a bigger speck of dust in orbit around another speck of dust, albeit a hot one. So where does this leave us? It leaves us like bloggers on WordPress, only on a much vaster, incomprehensible level. WordPress is a platform, with themes and widgets and all sorts of lovely-jubbly add-ons, with free hosting for the faithful here at WordPress.com and a standalone version for those who want to go it alone via WordPress.org. And we are invited to perform upon this platform. WordPress sets us free to blog as we will: they provide the platform; we provide the content … and somewhere out there, our readers join the dots and we become an amazing community in our social media matrix. There are good bloggers and bad bloggers and there are every kind of blogger inbetween. There’s facebook and twitter and youtube and the list grows on and on. Platforms designed for us to dance on. That’s God, my friends: the Ultimate Platform. Let’s dance! !